The top of your car can be a spot for extra storage or an easy to set up tent. The Tepui HyBox can do both. Car camping is a great way to experience the outdoors. It’s not as brutal as going deep into the wilderness with just a flashlight and a knife and not as lame as a full-on glamping experience complete with air-conditioned tents and a full-service bar. Sleeping in a tent on the roof of your car is probably the best way to car camp, but switching between roof-mounted storage boxes and tents is a huge pain, as is finding space in your already-crowded garage to store the one that isn’t being used. That’s why the Tepui HyBox is such a great product. 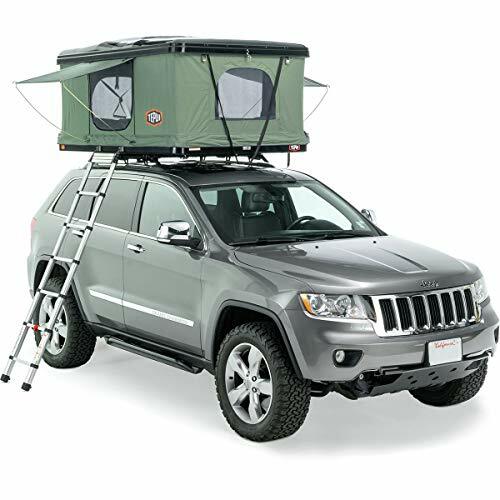 It cleverly combines a roof-mounted storage box and a pop-up tent into one unit that you can leave perpetually mounted to the rack or aftermarket bars on top of your vehicle. A roof-mounted storage box for your car that easily converts into a comfortable two-person tent. To use the HyBox as a storage box, simply unlatch the roof at the rear and it open the container via a front-mounted hinge. When everything’s packed the box closes down into an aerodynamic shape that doesn’t add much height to the top of your vehicle. And the whole thing weighs 11 pounds, so it won’t weigh your car down. When you’re ready to set up your campsite, simply pop the roof up and attach the canopy. It has mesh windows with roll-down curtains and doors on the left and right side that, when open, can be propped to create dual awnings. The roof is lined with an insulating material, and the canopy is a blend of 260-gram cotton and polyester with a waterproof coating. The shell is made of a super-strong plastic, and the lower shell is reinforced with a welded aluminum substructure and felt-lined honeycomb polypropylene panels. It’s more than strong enough to support two sleeping people or 23 cubic feet of gear the storage box. The HyBox comes with an eight-and-a-half foot telescoping ladder that can attach to either side of the tent and a three-inch, 40-pound mattress with a removable cotton cover for a comfy sleeping surface that’s easy to keep clean. At nearly $2,900, the HyBox is more than a casual purchase, but it’s a tough, versatile solution to a major headache car campers face.